If you’re like most women I’ve shown this secret to, you might find what I’m about to say a little hard to believe. But I stumbled upon the hidden loophole that makes or breaks any romantic relationship, or any potential relationship. And knowing this relationship secret virtually guarantees he’ll always find a reason to ignore you, or just plain shut you out, no matter how hard you try to connect with him. Right here in this free relationship-saving presentation, I’m going to show you the real reason men pull away and lose interest. And the 1 simple method I’ve discovered that can get through any man’s emotional armor, so he’s the one chasing you. Even better, you’ll never feel like you’re playing games or have to act in a way that isn’t totally authentic. My name is James Bauer. I’ve been a relationship expert for the past 11 years, specializing in teaching women how to instantly make men emotional putty in their hands. The best part about my method is it will never even dawn on him that you’re subtly opening his heart and molding him into the man who will passionately fight for your love. But the instant you use my relationship secret, your words will have an almost magical effect on his emotions, revealing the valiant, loving, vulnerable man of your dreams. So if you ever wanted to connect with a man so deeply that he’ll never lustfully look at another woman again, this is the most important video you’ll ever watch. You’re about to discover how to flood a man’s mind with desire for you, making you the constant center of his attention, even if he’s currently ignoring you or completely shutting you out. Because I’m going to show you how a few simple words guarantee you’ll be stuck in his mind all day, everyday, and how after you say these subtle words, he’ll be the one constantly checking his phone for YOUR call, text or Facebook message. Without this method, your relationship will always be an uphill battle. A roller coaster ride of emotions that eventually flies off the track. By the end of this video, you’ll know exactly how to get any man emotionally addicted to you, to the point where you’re the only woman he ever thinks about. Now, if you’ve ever struggled to get or keep a men’s interest and attention, you’re not alone. You can be People Magazine’s World’s Most Beautiful Woman and still lose his interest. That’s just men. It’s like we’re wired to lose interest in you, become distant and ultimately think about leaving. That is unless you know how to subtly trigger the same kind of adoring infatuation he felt the day he met you. Mind you, I’m not making excuses for ANY man, or putting an ounce of blame on you for, well, anything. But it’s important to know about his predictable withdrawal response, so you don't take personally how men naturally, and inevitably, act in a relationship. When you use my method, you can literally stop him from ever wondering if the grass is greener on the other side, and that’s true no matter what your current relationship status is. Even if you’re in the dreaded, “It’s complicated” zone. That last statement is really important too. Because my method is the missing link that can save, build or rebuild ANY relationship. It works in ANY situation, almost 100% of the time. Whether you want to get him, keep him, or simply make sure he’s constantly opening up to you. You know, making himself vulnerable. This secret works, because it addresses the very root of what makes relationships grow. Here’s what I mean, if your man, or the man you want, isn’t thinking about you, who IS he thinking about? Because he’s ALWAYS thinking about someone, and if it isn’t you, it’s someone else. I promise you that. That’s why, if you don’t use my method to “program” his attention, so it’s 100% devoted to you, his mind WILL wander and your relationship WILL suffer. But give me just a minute, and I’ll show you how to quickly and subtly make him addicted to you. Now, at the heart of what I’m talking about is appreciation. When you use my method, he’s feeling appreciated, and the power of appreciation is it grow’s or appreciates, and it brings you closer together, like magic. Because when he feels constantly appreciated, he wants to reach out to you and give of himself, making sure you’re feeling loved and taken care of. In other words, the more he feels appreciated, the more he wants to give and the more intimate your connection ultimately becomes. But don’t take my word for it. My method has worked for hundreds of my clients, including Lisa. Her story showed me how magical of an effect my method can truly have. In all honesty, I didn’t have a clue of how powerful this relationship secret was until I witnessed the impact it had in Lisa’s life. Her story proved to me how subtly using my method can quickly save even the most hopeless of relationships. Now, Lisa met Caleb when she was 16. They were high school sweethearts and spent 10 years of their lives together. 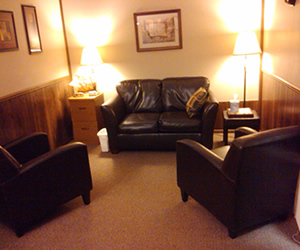 But when they started coming to me for therapy, Caleb had already moved out into his own place. As you can probably imagine, it was Lisa who dragged Caleb to the appointment, hoping I could help them reconcile. But it was obvious Caleb didn’t want to be there. He kept saying, “Lisa’s crazy. I’ve wasted years of my life, years of being unhappy”. Caleb wanted to be single again, and take advantage of his good looks. He said, “Settling down just isn’t for me. Lisa’s the only woman I’ve been with. I want to have new experiences. I’m sick of her craziness!” And that was just one session. However, the real truth didn’t come out until session two. Neither of them wanted to talk about it, but they were both victims of betrayal. Lisa had someone on the side, despite being with Caleb. And in the aftermath of a big fight, Lisa made a very common mistake. She texted the guy who was pursuing her, seeking emotional comfort by telling him how irritated she was with Caleb. He texted her the emotional comfort she wanted, basically hinting he would treat her better. You can probably guess what happened next, Caleb discovered Lisa’s text messages with the other guy. He quickly broke off their relationship, and almost just as fast, Caleb got into a relationship with another woman. My heart went out to Lisa. Even though things weren’t good, she still wanted him badly. She simply couldn’t deny her love for him. But after a few big fights early in their relationship, Caleb just got more and more distant. To the point of almost ignoring Lisa, which hurt more than anything else. They simply couldn’t figure out how to make things work, or get on the same page with each other. By the third session, Caleb decided he was done with therapy, which devastated Lisa. At that point, I realized I needed to give her the most powerful stuff I had. So I told Lisa about a brand new method I was working on, a way to rewrite her and Caleb’s story. Like going back in time and creating a NEW future, simultaneously. I helped Lisa see how trying to “fix” the problems Caleb was running from would never work, not head-on. So I gave her the beginning stages of my method. I spent hundreds of hours studying the brain as it relates to love. I watched my method work on less troubled relationships like clockwork, but I wanted to prove my method works in totally dire relationships when it was used in just the right way. And I have to say, what happened in the next few weeks shocked even me. It was subtle at first, but my relationship secret not only helped Lisa reduce their messy conflicts, it also inspired Caleb to automatically reach out more. In fact, Caleb suddenly found himself texting Lisa, almost compulsively, asking if he could come over to the house and spend more time together. It’s like he needed her, he wanted her, he couldn’t stop thinking about her. It was amazing because Caleb went from being angry and ignoring Lisa, to being caring and sensitive to her wants and needs. And it wasn’t long before he ravenously craved her body, her smell, her taste, her touch. Miraculously, they started reconciling, and created an even deeper connection than they had before. And that was just after TWO weeks! Now, imagine how, just like Lisa, you can use my method to inspire HIM to see YOU as the one, and awaken the REAL man inside. The man you know is a perfect match for you, the man who fights for you, stands up for you and puts YOU first. You see, from the moment you first talk to a man, you’ve got a story. And just like any story, there are always good parts, and not so good parts. The question is, are there enough parts of your story that keep him wanting more? Because there’s actually a “magic ratio” of positive-to-negative experiences, and this ratio predicts relationship success, longevity and break up’s with a 94% certainty. Other top relationship experts have pegged this magic ratio at 5 to 1. That’s when he’s truly feeling your love, and appreciation and THAT'S also when you can make him literally chase you. Now, this it critical, because if his primal need to chase isn't being triggered, he will lose interest, he will ignore you, and he will start thinking about other women. But here's why it's truly not your fault. It simply isn't enough to like or love someone. It's not even enough to believe your love is meant to be, because if you don't constantly trigger his chase mechanism, your story WILL have a VERY unhappy ending. Who wants THAT story? He doesn’t, but you don’t either, do you? No matter how disconnected you're right now, the closeness you're seeking is just a few simple, subtle words away.Heck, your relationship could already be over, or never even started. But if you want him back, if you want to get him for the first time, if you want to keep him in your life, or you just want to keep discovering deeper levels of intimacy, my method is HOW you do it. One caveat, you aren't getting, getting back, or keeping the relationship you have. Nope. You’re actually creating a whole NEW relationship. You're actually creating a whole NEW relationship. Because my method literally rewrites his emotions, changes the past, and make your amazing future together, well, possible. With my method, you'll quickly surpass a 5 to 1 ratio of positive-to-negative experiences, without him even realizing it. My method is THAT subtle. And when you use it, he won't associate you with the bad stuff anymore. Instead, he'll be more drawn to you than ever. Constantly anticipating your next phone call, text, or wondering when he gets to see you again, like a child waiting for Christmas. It doesn't matter if you've known each other for 1 month, Or 50 years. It doesn't matter if he's emotionally shut you out of his life, or even left the relationship. It doesn't matter if he wants to see another woman, or already IS seeing another woman, my method can win him over and FORCE him to chase you, like your very existence is a tractor beam, capable of pulling him towards you from a distance. That’s a big deal too, because it means the difference between an exhausting, depleting relationship, or a fulfilling, loving, effortless one. Sounds amazing, doesn't it? And by now, you're probably wondering how my method, you know, works. Right? Well the answer is the “happy brain chemical” called Dopamine. You may have heard about dopamine, but did you know it can literally program him to love and want you? Here’s the deal, dopamine makes him feel rewarded whenever it’s secreted in his brain. It vividly imprints your last interaction, so the NEW emotion overrides the OLD story, making the bad memories from your past relationship virtually disappear. My method will ignite your physical and emotional intimacy to feel hotter and more authentic, than anything you’ve ever felt before. That’s not an exaggeration either. Once I saw how effective my method was for Lisa, I knew I stumbled upon something that could profoundly transform ANY relationship or would-be relationship. You will be replacing the old, bad memories with more powerful NEW memories in your lover’s or potential lover’s mind. One of my clients even coined my method a “Time Machine”, because it gave her the power to transport her relationship back to a time of deep connection, a place that she thought was only reserved for their honeymoon phase. That’s why I’ve condensed and refined this secret into something YOU can start using and getting results with TONIGHT. And I have to tell you, I couldn’t be any HAPPIER with how it turned out. I call it The Relationship Rewrite Method. You’ll be shocked at how easy it is to use this brand new relationship saving, relationship making method. This secret WORKS when everything else you’ve tried failed and failed miserably. And like I just said, using my method won’t just help you get him or get him back, it’ll empower you to effortlessly develop a better, more loving and WAY more intimate relationship. Now, I know this sounds unbelievable, but it’s actually based on some cutting-edge science. Without getting too complicated, the release of dopamine creates what’s known as a Positive Feedback Loop in his thinking. It “lights-up” the reward circuits in his brain, so every time you use my method, you’re triggering a dopamine release, developing new, stronger emotions about you and your story, which transforms the way he sees you and instantly rewrites your past relationship. Basically, your ex associates you with feeling good. You’ll go from being a villain to a hero in mere seconds. Heck, you can go from being non-existent to him, to becoming the center of his universe almost instantly. is knowing how to push the right emotional hot buttons. That may not sound earth-shattering, but think about this: Social media pioneers, like Mark Zuckerberg, discovered that people are dopamine addicts. Facebook’s success is largely about seeking attention. For example, every time you “like” someone’s post on Facebook about their new haircut, you’re triggering a dopamine rush, giving the recipient a surge of pleasure and validation. And that’s just from some random click. Imagine how powerful this effect is face-to-face, or in a perfectly timed text. Using my method is like having the secret combination to “unlock” deeper intimacy. I have a very specific way to use this secret combination, so you can lead the way in developing the future you want with him, a future you always wanted with him, but could never reach because he always shut you out. One caveat, my technique requires authenticity to work. If there isn’t true love between you, there aren’t any emotional hot buttons to press. That’s just reality. You have to genuinely care about him for my method to work. Because it’s that underlying bond that exists between you that MUST be triggered. And the more authentic you are when you use my method, the more dramatic of a positive feedback loop you’re creating in his mind. You don’t have to play games anymore, that’s the genius of this formula. OKay, now here’s why he’ll be the one chasing you. We’re naturally hardwired to seek out pleasure, and avoid pain, makes sense right? Well, every time you use my “rewrite” method, you’re giving him pleasure, hypnotically seducing him to obsessively NEED you. Because his brain is constantly seeking YOUR clever dopamine triggers. At the same time, your “old relationship” is being quietly rewritten, because he’s rapidly connecting, or reconnecting with your deep spiritual bond. In The Relationship Rewrite Method, you’ll quickly understand how to make any man want you, crave you and secretly adore you. Like you’re the only woman who exists in his mind. You’ll discover the power of Reciprocity. This concept is based on powerful clinical research that exposes the basic instinct in your man to give what he gets. It triggers "the chase" mechanism within him, which is a BIG part of what dopamine does. I'll show you how to employ the art of giving compliments. You'll discover how to make your compliments feel and sound 100% natural. You'll also receive 5 sessions-worth of compliment coaching, this is worth over $1000 value in my private practice alone. From my extensive research, compliments are the MOST surefire way to trigger a hefty dopamine response. I'll give you a crash course in the power of Storytelling. This is one of my proprietary coaching techniques that repeatedly rekindles romances-gone-bad. This makes him root for your relationship to succeed, like he's the leading man in YOUR romantic comedy. I'll reveal a sneaky tactic I call The Power of the Request. This tactic leverages the natural wiring in your man's brain to take ownership over your relationship, and make him attached to your future together. Which again triggers "the chase" mechanism within him, so he's the one pursuing you, and trying to make your relationship work. You'll also discover the power of scarcity. This technique shows you how to set healthy boundaries. This will intrigue, attract and hypnotize him into wanting you. And even better, it gives YOU the healthy dose of self-esteem you deserve. I'll even give you a "foot in the door" strategy that makes him pay attention to you, even if he's presently ignoring you, or has completely shut you out of his life. Now, bear with me for a second, I want you to imagine you're at a crossroads: To the left is your future WITHOUT the man you love; the man you want. The man you believe could be "the one." He started ignoring you, left the relationship, or never even let you into his heart in the first place, because he wasn't getting enough dopamine. So he went where he DID get it. Like I already said, if he isn't getting it from you, he's definitely getting it from someone else. Now, to the right is the future you truly want; A future where he's constantly fighting for your love and attention, a future where he yearns for you, reaches out and wants a deeper and deeper commitment. Bringing out the most romantic version of himself, a guy you've probably never met. Can you see THAT future? Can you see him holding you so tight that it makes your heart overflow with love? Can you see him giving you those desiring eyes reserved only for you? Can you see him going out of his way to always make sure you're happy? That you're receiving the love he wants you to feel in every cell of your body? Maybe the biggest question of them all, Does your future together already FEEL completely real to you, and the absence of it fills your gut with pain? If so, you're why I created The Relationship Rewrite Method. Because you wouldn't be feeling so much pain, or be wondering so deeply if your love is meant to be, if you didn't absolutely KNOW you're being robbed of the chance at your relationship destiny. With that in mind, a quote that always resonated with me, especially as it relates to relationships is "Destiny is not a matter of chance, it's a matter of choice." And you get to make that choice right now. You get to choose to grab your destiny by the reigns, and create the future you want. Instead of feeling like getting him, keeping him and growing a truly memorable relationship is out of your hands. You get to CHOOSE which fork in the road you take RIGHT NOW. Just like Lisa did. Now, until recently, you had to pay me $150 for just a single one hour session. And it takes numerous sessions to break down all of the information I've included in the The Relationship Rewrite Method. That's why I wrote it. Because remember, my method addresses the core of what makes ANY relationship reach it’s REAL potential, so you BOTH get the love, attention and security you deserve. You get to have access to this powerful method, without committing to hours and hours of expensive therapy sessions. And whether this is your first choice to get, save or strengthen your relationship, or your very last resort, it doesn't matter. made you pull your hair out with sheer frustration! So to make this as much of a no-brainer as I can, without just giving away my life's work for pennies, I'm offering you the chance to rewrite your past. And pave the way for the future you hold in your mind's eye, without having to worry about the price. That means, I'm not going to charge you $197, I'm not even going to charge you $97. If you act right now, I'll give you The Relationship Rewrite Method for the low one-time price of Just $47. Quickly, here's what will happen, when you click the button below, you'll go to a secure ordering page. After you make your purchase, go ahead and open up to Page 12 before you do anything else, and do that 4 minute exercise. Then watch in amazement as he quickly opens up and starts reaching out on his own, making him the one who's almost compulsively fighting for your love and attention. That's my unconditional guarantee too, because if The Relationship Rewrite Method doesn't give you the results I've promised you, I don't want or deserve a cent of your money. So if you don't almost instantly trigger his chase mechanism, or somehow decide it's not even worth your time to try, I'll give you a quick and courteous refund. Absolutely no questions asked. Look, I've been working with women to improve their relationship for over 11 years. I've never seen anything work to literally make him obsess over you like with my exclusive method. And after watching it work in hopeless situations, like with Caleb & Lisa, I can wholeheartedly declare, this method is the only thing you need to create the relationship you REALLY want. And as soon as you try it here in the next few minutes, just watch as he transforms right before your very eyes. Because hey, you're putting him under a hypnotic spell that makes him stop running and start chasing you! It's like one of those romantic comedies, where she wants him badly, chases him, but he just continues ignoring her. Until she discovers a cool way reverse the roles. Can you see that movie? Can you see how he cherishes you without reservation, and your relationship becomes everything you ever hoped for? Well, that relationship, that man, they're both waiting for you. Right now. But you have to take that next step and start using my method to get there. That means, what you do now is critical. Don’t wait for him to call or just wish he’ll somehow see the light. Don't give him an ultimatum that pushes him into another woman's bed. Don't let yourself continue to feel like a victim to his emotional distance. Download your instantly available copy of The Relationship Rewrite Method now, and unlock your destiny by rewriting your old story with a beautiful NEW one TODAY! I'd love to hear how The Relationship Rewrite Method helped you take back your power to choose your own destiny. But before I let you go so you can discover what’s in The Relationship Rewrite Method, I have to reveal one more thing about your man. Now you might not know this, but your man actually needs your permission to give to himself, to go out and have fun with the guys, to go wander and be a free spirit, to go do the things that fills up his emotional tank with MORE love for you. The catch 22 is, how do you give him permission to go out and have fun by himself when you're insecure about whether or not he's fully committed to you? The answer IS my method. It guarantees that no matter where he is, you're always on his mind. 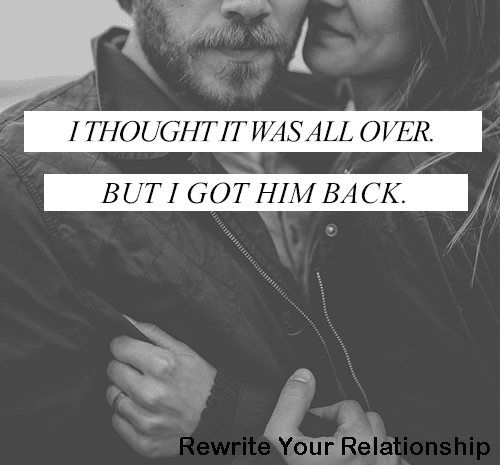 And not only that, but if you've ever felt like your happiness depends on the health of your relationship, The Relationship Rewrite Method will rapidly put your power BACK in your hands. So you never feel emotionally dependent on him again. Or anyone else for that matter. With my method, you won't have to worry about him becoming distant, pushing you away, or outright ignoring you. This is truly the secret to making your relationship achieve the kind of intimacy usually reserved for the movies. And while my method is far from fictional, you WILL feel like you're living a fantasy. I'm not happy with anything less, you shouldn't be either. Again, that's my guarantee. Thanks for watching and here’s to making today the first day of the rest of your life, both of your lives! Click or tap on the button below and claim the future that's meant to be. P.S. - The Relationship Rewrite Method Reviews are in and people love this course. Click here to see read some of my many course reviews.